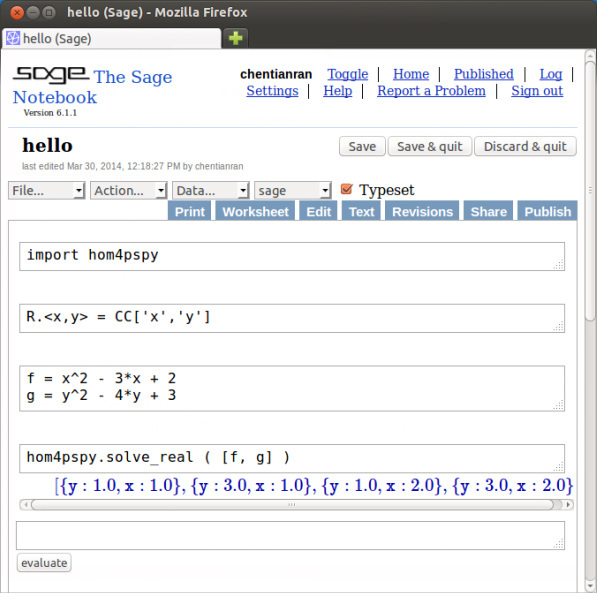 Sage is a free open-source mathematical software with features covering many aspects of mathematics, including algebra, combinatorics, numerical mathematics, number theory, and calculus. With the interface for Hom4PS-3, Sage is one of the easiest way to use Hom4PS-3. 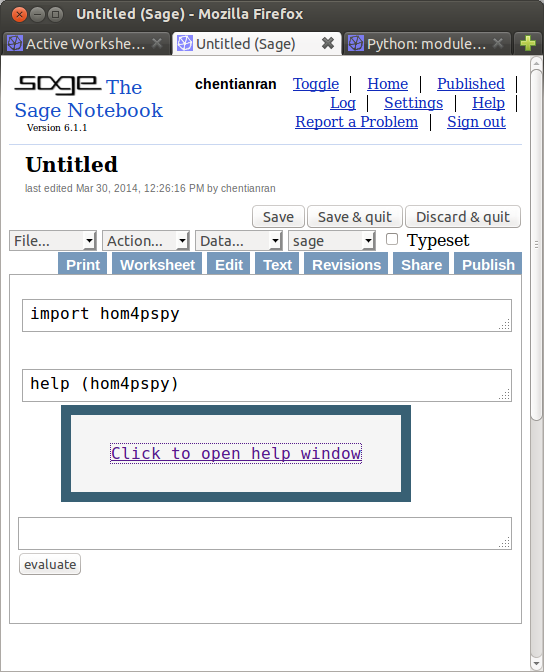 Through our public Sage notebook server, you can use Hom4PS-3 now via an web browser without installing any software. Simply follow the three easy steps. First, open your web browser and head to hom4ps3.math.msu.edu and sign in with your user name and password. If this is the first time you are using this, you will need to create sign up for a new account by clicking the "sign up for a new Sage Notebook account" link. After you have signed in, you should be able to see your existing worksheets, if there is any, as well as the option of creating a new worksheet. You can use any worksheet at this point. which finds the four real solution. 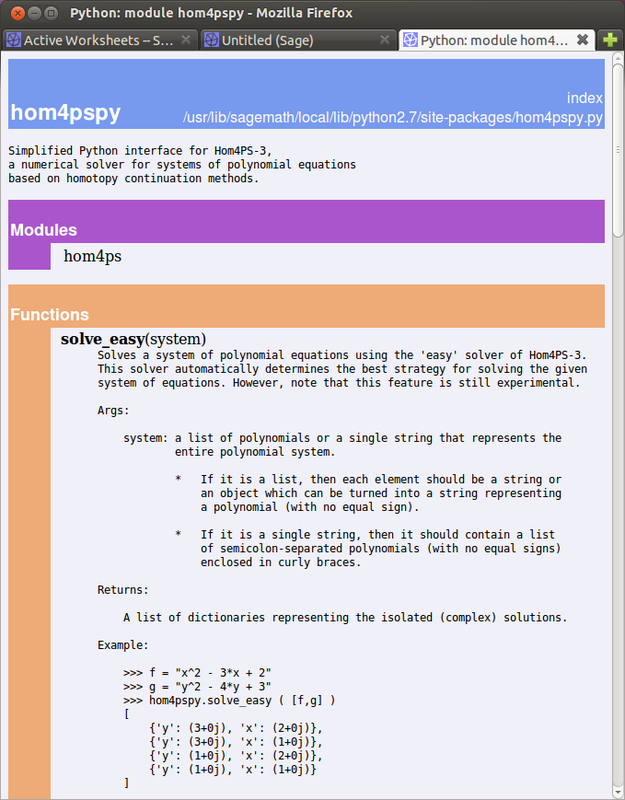 Just like with any Python module, one handy way for finding out the basic usage information of the functions included in the Hom4PS-3 interface is to type the command "help (hom4pspy)" directly inside the Sage Notebook worksheet. To find out more information on how to use Hom4PS-3 or how it works, you can read the F.A.Q. page or the Documentation page. You are, of course, always welcome to email us as well.